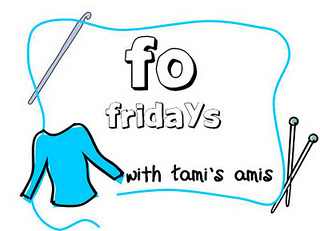 Stitched Together: Blog Week Shawl Winner! I said that when I finished the Blog Week Shawl I would announce the winner of said completed shawl. Well I can reveal that the shawl is currently being blocked outside and will be dry in a matter of hours! This photo shows why it is easier to block this shawl outside, than try to make it fit indoors! It also reveals why I haven't been online much this week. This photo was taken at 10am! Look how glorious our weather is! 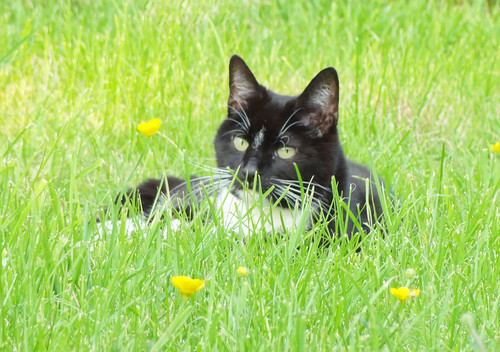 This week has been wonderfully warm. It is estimated that today the temperatures will reach 25°C or 77°F. You would understand how unusual this is, if you knew that our average temperature for May is around 16°C or 60°F. We normally only get these kinds of temperatures in the height of Summer, if we are lucky. We have had temperatures like this all week. I have been enjoying them, as has my cat. My pain levels are much reduced in warmer weather. This has meant I've been able to go out TWICE this week. I'm hoping as the weather is set to continue until Sunday I may be able to go out somewhere over the weekend, or even have friends over! I feel like I'm on holiday in the Mediterranean. All this activity has left little time for blogging or knitting. The warmer weather has reduced my compulsion to knit, but it has meant I have been outside with my camera taking photos of our woodland glade of garden. 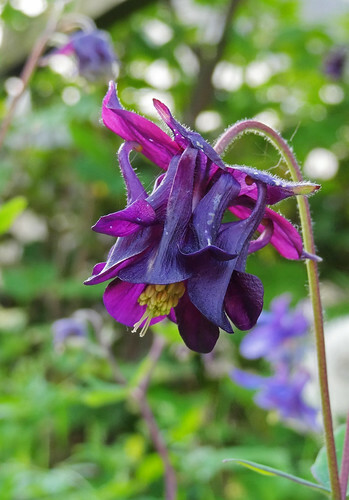 I love aquilegias. These grow underneath our apple tree. I want yarn in this colourway! 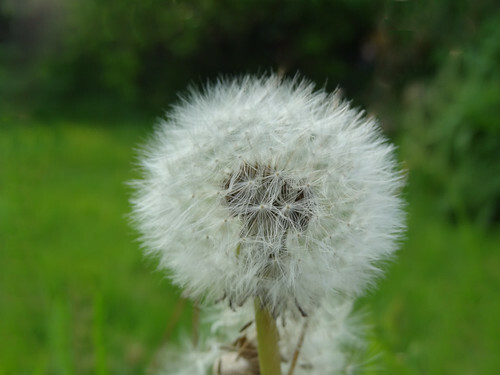 No overgrown UK garden is complete without dandelions and their seed heads! 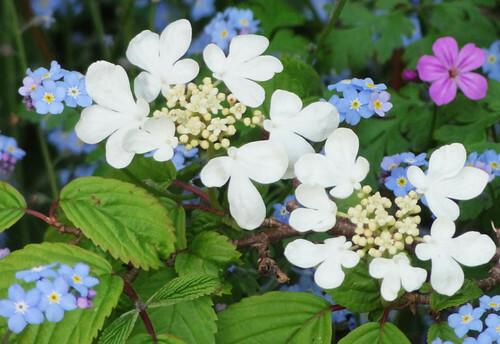 These are the flowers we have hiding underneath our lilac tree. The white flower is from one of the only shrubs we have planted in our 8 years of being in this house. I think it's some kind of verbena plant. It's survived well considering our neglect. I do love our garden and I wish I was able to work on it, because with the right care it could be glorious, but instead, it is simply appealing. 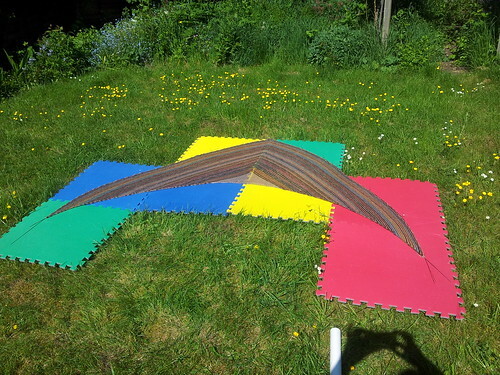 So enough of our garden, and back to what you are really interested in - who won the Blog Week Shawl? There were 68 people who left comments, I didn't get to use all of the numbers left in making the shawl, but everyone was included in the draw. 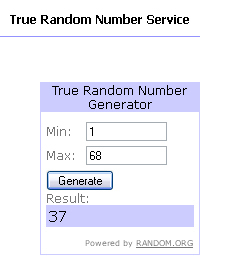 The number chosen by the True Random Number Generator was 37. The 37th person to leave their number was Cyprienne Zed, who is in Maryland, USA and chose colour number 4! I have emailed Cyprienne to let her know she's won and I will hopefully get the finished shawl out to her in the next week. Thank you so much to everyone who took part in this experiment. I think the finished shawl looks great and I hope that Cyprienne enjoys wearing it too. To see some properly finished projects, click on the button!